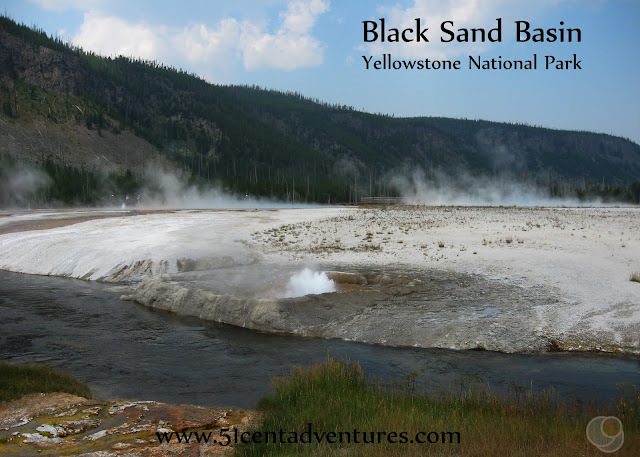 Description: This desert state park is located on a plateau that sits 2000 feet above the Colorado River. The river has slowly cut through the land exposing millions of years worth of layers of sandstone. The rock layers have eroded into pinnacles, cliffs. and plains. The view is spectacular every way you look. Location: The park is located to the west of Moab, Utah. The route to the park is kind of roundabout so it is a 35 mile drive from Moab. Cost: Entrance fee is $10 per vehicle or free with a Utah State Park Pass. Camping is $25 for the Kayenta Campground which has partial hookups for RVs. Or you can stay in one of three new yurts for $80 per night. Operating Seasons and Hours: The park is open from 6:00 am to 10:00 pm. The Visitor Center is open from 8:00 am to 6:00 pm from March 15 to Mid October, and from 9:00 am to 5:00 pm from Mid October to March 14. This was the second stop of the sixth day of the Southern Utah Road Trip that my husband and I went on for our third anniversary in May of 2010. 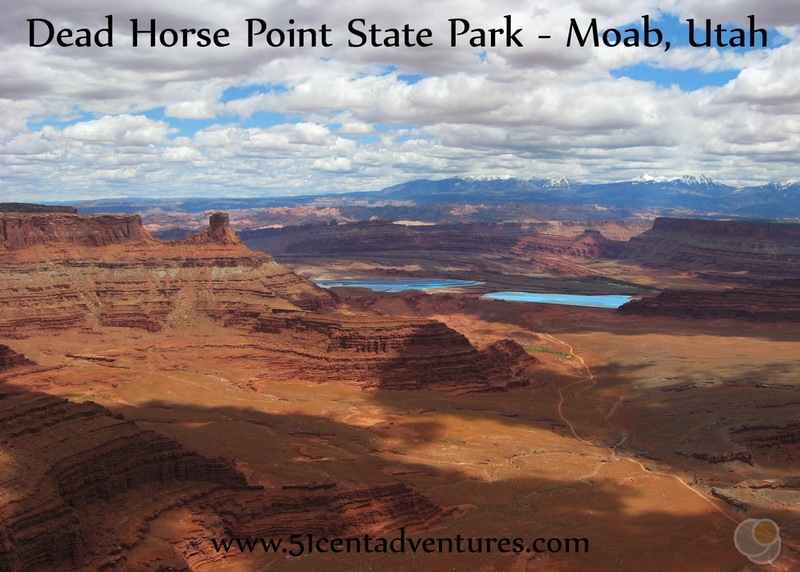 We left Main Street in Moab, Utah and drove about 35 miles to Dead Horse Point State Park. I can't talk about our visit to Dead Horse Point State Park without bringing up the most memorable part of our trip. I know this is a bit of a digression for a travel blog, but it's an interesting story so go with me here. My husband and I had been trying to have a baby for most of our marriage. Part of the reason I planned such an elaborate road trip for our third anniversary was because I was trying to not dwell on the fact that I was having trouble getting pregnant. I was amazed to find out I was pregnant a few weeks before our vacation. The day before we left for our vacation we found out I was 11 weeks along with twins! We were in shock and very excited. The news didn't change much about our trip, I knew I would just have to be a little more careful. Things seemed to be going okay until our drive out to Dead Horse Point. My stomach started to hurt, and I couldn't wait to get to the park so that I could go to the bathroom. In the bathroom I experienced what I thought was a miscarriage. (I'm leaving out the gory details - you're welcome) I was devastated. I changed my clothes, and then my husband and I both just stood on the edge of the overlook and stared out at some of the spectacular scenery. We took a few pictures out of habit, but mostly we couldn't feel anything other than sadness. My husband took this picture of me, which is surprisingly one of my all time favorite pictures of myself. Don't be fooled by the smile - there is pain hiding behind that happy face. We considered visiting the hospital in Moab. But I didn't want to spend part of our vacation in a hospital waiting room, just to have someone confirm what I already knew. We considered ending our vacation and going home, but we didn't want to do that either. So we just kept staring at the scenery. Really though we had no reason to be sad because I was still pregnant! We wouldn't find out until six weeks later though. My doctor's office back in Logan didn't follow up with me very well. We were also preoccupied with moving to a new city. Once we got settled in our new place in Bountiful, Utah I started to wonder why my stomach was still so hard. I scheduled an ultrasound thinking that maybe I had some retained placenta or something. Instead my husband and I were astonished to see two healthy baby girls on the monitor. Those girls are now 4 years old. They've been joined by a younger brother and sister. By the time my husband and I were celebrating our seventh wedding anniversary we had 4 kids. I'm always very grateful for my children because I know what it felt like to think that my chance to raise them was taken away. 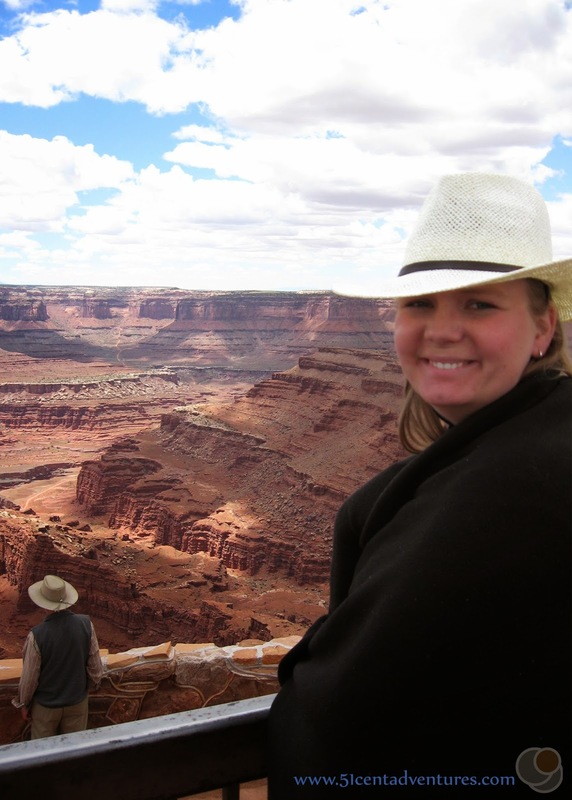 So what did happen out there at Dead Horse Point? I think I have a pretty good idea. Now that I've been a mom for over four years I've spend a lot of time comparing pregnancy and labor stories with other moms. I've known several women who have experienced the same symptoms that I did, and were told it was the placenta hemorrhaging. What's amazing is that my babies were fine even without medical care. Okay, thanks for humoring me and reading one of my crazy pregnancy stories. Believe it or not I actually have more. I can be kind of clueless when it comes to understanding what my body is trying to tell me. That leads to odd situations - like when my fourth child was accidentally born in the hallway of our home. I'll have to share that story with you one day. Anyway, enough about pregnancy - let's talk about travel! Dead Horse Point State Park is located on a plateau above the Colorado River. At it's most southern point the plateau narrows to a small neck of land and then widens slightly again. This slightly wider spot is the official "Dead Horse Point" of the state park. Legend says that cowboys used this area as a corral for wild horses while they selected the ones they wanted to sell. The cowboys would block off the narrow neck of land with brush to keep the horses from escaping. Usually the horses would be set free within a few days. However, one time they were not set free and all the horses died from thirst. Hence the name. 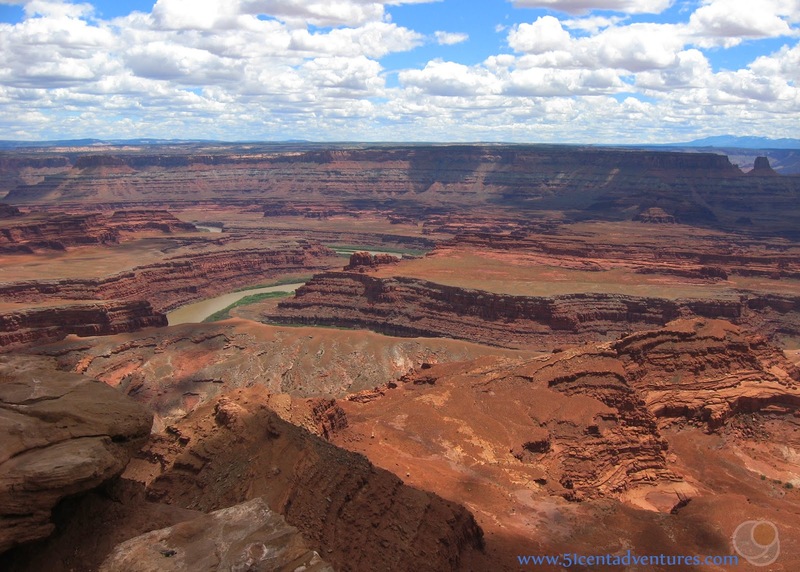 Looking out over the scenery of Dead Horse Point State Park is like looking at a time capsule. All the rock that you can see was laid down over millions - yes millions - of years. After the sedimentary layers were in place, the Colorado River was formed and started cutting through the rock. The river has been winding through this area, eroding away the sandstone rocks ever since. The Colorado River brings life to the areas that it touches, but most of the rest of the area is a desert. Plants and animals have learned how to adapt to the harsh environment. The park Visitor Center has displays that talk about how life can survive even in the most extreme climates. There are many overlook areas where you can take in the 360 degree vista. Or if you have more time you can hike around Dead Horse Point via the Bighorn, West, and East Rim Trails. There are even 16.6 miles mountain biking trails that cross the plateau. This network of trails is known as the Intrepid Trail System. These trails stay on the plateau, so there aren't any huge elevation changes. Recommendation: The view from Dead Horse Point is spectacular. It's worth it even if you can only stay for a little while. Directions: Dead Horse Point is almost directly west of Moab, Utah, however there isn't a road that easily connects the two locations. Instead you have to drive north on Highway 191 for about 15 miles. Then you turn left onto State Road 313 and stay on that for another 18 miles. State Road 313 travels to the south west. There will be a split in the road. The right fork will take you to the Island in the Sky District of Canyonlands, the left fork will take you to Dead Horse Point State Park. There are signs all along the way, so really it's not that complicated. Additional Information: There are some rather unique features that are visible from Dead Horse Point. Two bright blue ponds stand out against the tan sandstone. Intrepid Potash has two drying ponds that are to the east of Dead Horse Point. Potash is also known as potassium chloride which is an ingredient in fertilizer. Water from the Colorado River is directed to the ponds where the desert heat evaporates the water leaving the potash behind. That was a real simple explanation of the process. If you want to learn more you can check out the videos that Intrepid Potash has made available on YouTube. Click here for the IntrepidPotashVideo Channel. 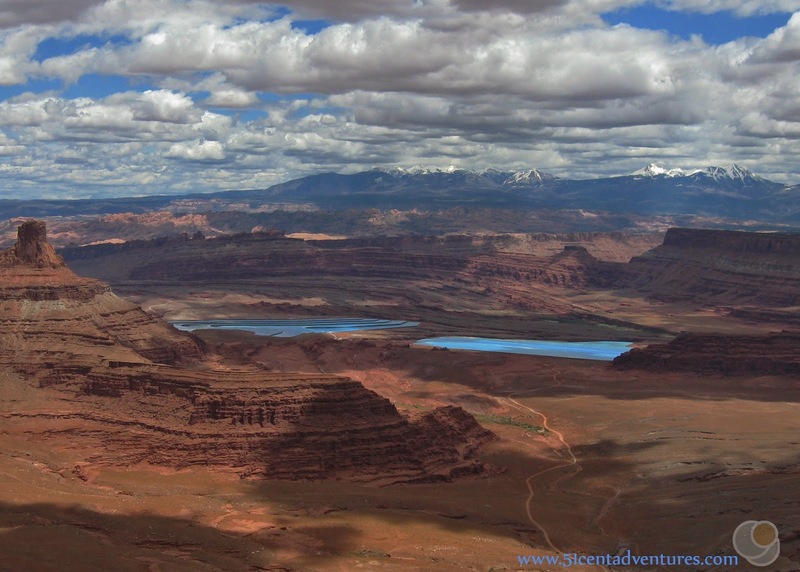 Places Nearby: The Island of the Sky District of Canyonlands National Park is just down the road, and has very similar scenery to Dead Horse Point State Park. 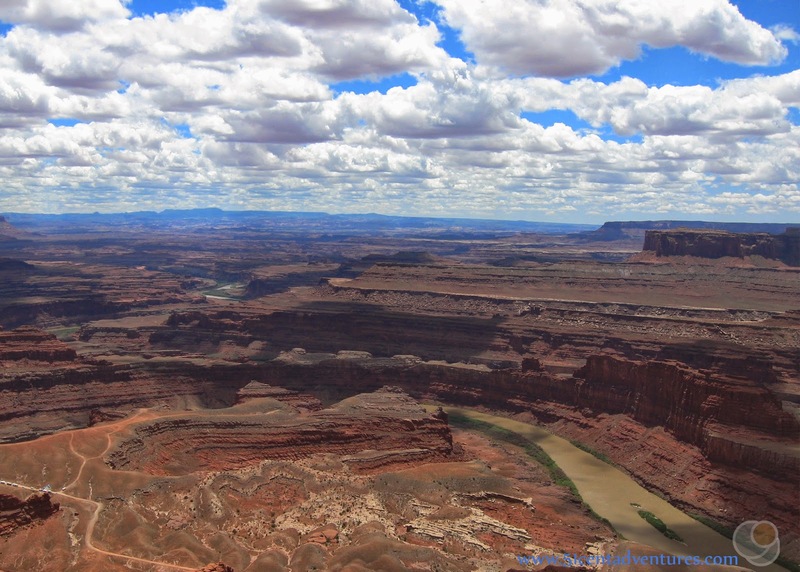 For an in-depth comparison of the parks check out my post titled: Island in the Sky District of Canyonlands National Park vs Dead Horse Point State Park. 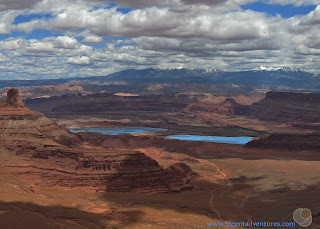 Next Stop: Island of the Sky District of Canyonlands National Park.